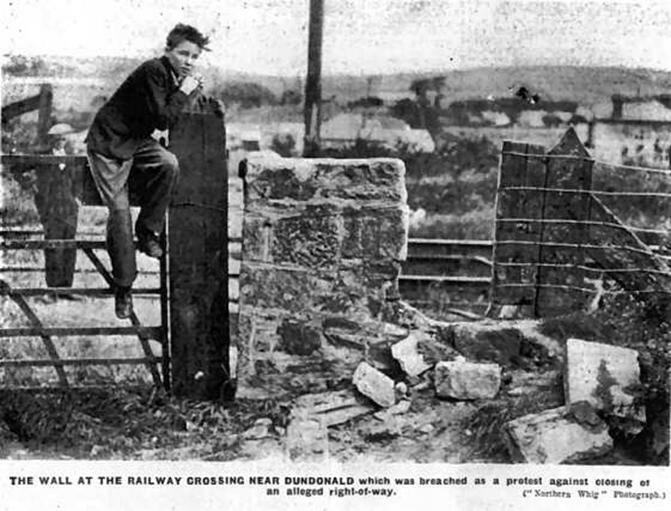 In 1938 the residents of Dundonald took on the might of the Belfast & County Down Railway Company in a dispute over the right of way across “Quarry Lane Stile”. The picture below was taken at the time. It is looking down the newly created Grand Prix Park towards Dundonald village. The school is directly ahead in the distance. You can see at this time houses are beginning to be built. Problems arose when people, especially those living on the “wrong side” of the tracks started to use this crossing for access. This Photograph was taken by famous Belfast photographer Alexander Hogg 1870-1939. It is dated 2nd July 1938 which was in the middle of the “crossing dispute”. The demolished remains of the blocked up stile can be seen to the right of the gate. It is likely that the B&CDR company commissioned Hogg to record this photographic evidence to support their case in court. Please note that this photograph has been reproduced with the permission of National Museums Northern Ireland and may not be downloaded, copied or reproduced in any form without their consent. The map left shows the crossing in 1902. (The station is about 500 ft the right of the quarry). This shows that Quarry Lane Crossing was built as an ordinary farm accommodation crossing. It was originally put in place in 1850 for the owner of the land severed by the railway as it wended its way from Knock to Dundonald. The crossing was known at the time as “McKenzie’s accommodation crossing”. The landowner had a legal right of way across the railway and held keys for the gates at the crossing. 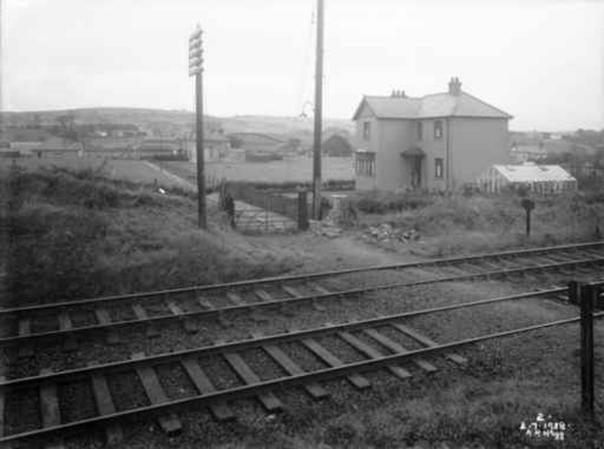 The crossing was situated at the end of a laneway which ran from a farm on the Old Dundonald Road to a Quarry and some Workmen’s cottages near the Railway. On the other side of the railway a footpath ran down to the Comber Road, and then up to the school, churches and centre of Dundonald village. The crossing itself consisted of two farm gates, one on either side of the tracks. The gates were in the distinctive rising sun design used by the Company. Beside the gates were two stone stiles, one on either side of the line. During the years between the wars, the population of Dundonald doubled. Many of the newcomers were ‘townies’ from the ever expanding city of Belfast. By 1937 the population numbered 1,664. Many new houses were built to accommodate the rising demand. The railway encouraged growth in the south of the parish. Middle-class villas were built along the Old Dundonald and Comber Roads, whilst less grand dwellings of tin and wood sprang up on Quarry Lane and the Gransha Road. The areas locally becoming known as ‘Tin Town’ and ‘Timber Town’ respectively. At this time a new development of villas was built around a road centred on the old path from Quarry Lane crossing to the Comber Road. This was named ‘Grand Prix Park’ in honour of the annual T.T. race, of which the Comber Road formed part of the course. For people living south of the Railway there were two routes for crossing the railway lines to get to the village. The first was to go via the road bridge at the station. The second and more direct route for many was to go down Quarry Lane, across the tracks and down Grand Prix Park. As more and more people used the crossing the Railway Company began to take notice. The Board ever mindful of the risk of legal action arising from an accident agreed that the stiles at the crossing should be removed “in order to counteract any suggestion that their being there was an invitation to the public to make use of the Crossing.” This was in accordance with legal advice given to the Company in 1923 that all such stiles should be removed. The fact of the matter however was that the route down Quarry Lane and Grand Prix Park offered a substantial short cut for many living south of the railway, if they wished to go to the village (a short cut which is still used by locals to this day). We must remember that motor cars were not in such abundance as today and most people had to walk to attend school, to visit the shops or to worship at their church. The Company Engineer arranged for the stiles to be built up. 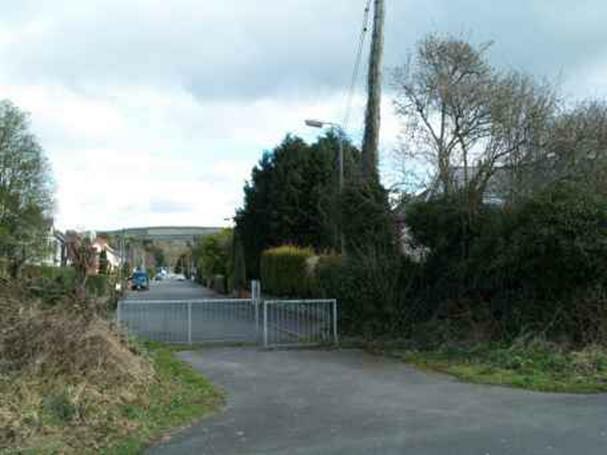 If necessary, keys for the gates would be supplied to the residents of the workmen’s cottages adjacent to the crossing, though only if they could prove they had right of way to cross the railway. The local residents didn’t take this move lying down! No sooner had the stiles been blocked up than some firebrand residents knocked the work down again. The company blocked them up again, and again the work was knocked down. This continued for four consecutive days from the 22nd June to 25th June. This photograph reproduced from the Weekly Northern Whig Newspaper June 1938 shows the crossing from the Quarry Lane side looking across the railway towards Grand Prix Park and Dundonald Village. The rubble from the demolished attempt to block up the stile can be seen strewn about the ground. The final demolition occurred on the 25th June prior to a protest meeting which was attended by over 100 people. They assembled on either side of the line where they were separated by the stone and earth walls built up by the Company. Using a plank of wood as a battering ram, some of the men in the crowd knocked down the walls. With the way cleared, the crowd merged for the meeting at the top of Grand Prix Park. Stanley Wright the principal of Dundonald Public Elementary School addressed the crowd. He stated that 65 school children used the crossing everyday and that since the way had been barred school attendance had been affected. Perhaps it was more a case of any excuse for a day off school! 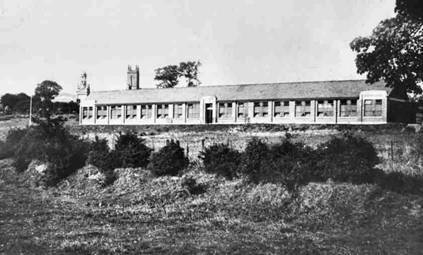 The photograph to the right shows the ‘new school’ built in 1923. A path led to the school from the Comber Road directly opposite grand Prix Park. The police also attended the scene but did not interfere, seeing the matter as one for resolution by the residents and the Railway Company. A petition to Mr. Andrews, Minister of Finance, M.P. for the area and BCDR Director, was signed on behalf of the local Presbyterian Church, Church of Ireland, Methodist Church and by the people of the district. The result was that the place was left quite open and the Company felt obliged to post Watchmen until the matter could be resolved. At first they turned to the Police. They, however, were completely uninterested in getting involved, stating it was a matter for agreement between the residents and the Company. Perhaps it was that the local constabulary had some sympathy for the residents’ case. Not to be deterred, the Company turned to the law. The Company’s solicitors Messrs. E & R. D. Bates advised application for an Interlocutory injunction to restrain the local inhabitants from “further interference with the Company’s property”. This was to be pursued against the six men who the Company believed had done the damage. The residents of Dundonald responded with a deputation to the General Manager. This consisted of the Rev. James McQuitty (Presbyterian), Rev. John Cotter (Church of Ireland), Messrs. Bossence, Fullerton (Methodist minister), J. W. Porter and Stanley Wright (Primary school principal). These gentlemen were anxious that something be done to provide a footbridge. The Company, however, continued to pursue its legal action. The case came before Mr Justice Megaw at the Chancery Court of the Royal Courts of Justice at 11 a.m. on Wednesday 22nd March 1939. (Picture courtesy of St. Andrews University Library). The Company’s injunction was not defended as the six men in question had no means of meeting the legal expenses. The Courts granted the Company’s injunction and awarded costs against the defendants, William Jamison, labourer, Old Dundonald Road; William Collins, labourer, Wilmar, Quarry Lane; Andrew Walsh, electric welder, Quarry Lane; William McGuffin, electrician, Quarry Lane; Ernest Martin, labourer, Hill Crest, Old Dundonald Road, and Thomas Moore Sen., labourer, Quarry Lane, Ballybeen, Dundonald. No compensation was applied for or allowed. The Company decided not to pursue the matter of costs as the defendants were all working men and there appeared to be no prospect of their being able to pay. 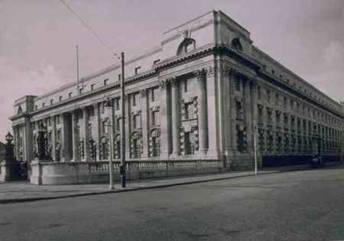 Mr. Justice Megaw said the crossing had been used by a great many members of the public by reason of the non-interference of the Company. It was, no doubt, a great convenience. Overhead or underground accommodation would be of value, but the Company did not feel justified in incurring the expenditure. The stiles were again built up and the Watchmen withdrawn from the area. After the court case the Board considered closing all stiles at accommodation crossings to avoid any further trouble like that which had taken place at Dundonald. In 1939, it was estimated that there were approximately 104 stiles at level crossings on the system. It seems, however, that this action was not acted upon, the Board preferring to deal with these matters on a case by case basis. The residents formed the “Dundonald Right of Way Association” and continued to lobby for passage across the railway tracks at Quarry Lane. They asked the Company if they would be prepared to dispose of the metal Footbridge at Tillysburn and move it to Quarry Lane. This Halt had been closed since 1931 and the bridge was unused. This, however, never came to pass and it can only be assumed the costs involved proved to be too high and the matter was abandoned. Soon the nation was to be plunged into war and minds no doubt were occupied by more important matters. Wartime traffic saw the re-opening of Tillysburn in 1941 until its final closure in 1945. The bridge was eventually moved, not to Dundonald but to Mount Halt on the Larne Line by the UTA. 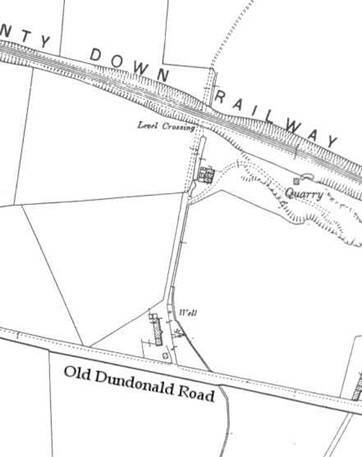 The residents of Dundonald would have to wait until 1950 and the closure of the County Down railway before free passage was once again available down Quarry Lane onto Grand Prix Park. The view down Grand Prix Park in 2013. The Comber Greenway has replaced the railway; pedestrians most welcome!